Scan the online writings of Amy Lansky, author of Active Consciousness: Awakening the Power Within. The book has its own website, activeonsciousness.com, where you can find out more about the book and about Amy's quite remarkable background. For openers, she offers many exercises, meditation and others, that one can use to raise ones level of consciousness. She presents these in a very approachable way, reminding us a bit of The Power of Now. She also cites a lot of serious consciousness research, demonstrating the reality of the paranormal (precognition, telepathy, etc). (Poster’s note: And if those exist, why shouldn't reincarnation and karma and doing Yoga to light up your chakras?) She talks about setting goals for yourself, and then letting your unconscious guide you toward achieving the goals – like Jim Fadiman's Unlimit Your Life: Setting and Getting Goals. Her hopes for expanded consciousness go beyond personal transformation, and her central concern I think is really social transformation. As one of the reviews on the website puts it: She proposes that we can – and indeed, must – develop our own powers to perceive the forces that underlie the universe and then use those powers to consciously create a much better world. I think this makes a lot of sense, as far as it goes. It isn't a solution per se to the problem of social transformation, rather it's a pointer to where we might look for solutions. It's a call to push the boundaries of our consciousness, and it can also be seen as a call for further research: seeking to identify which forces might be involved, and how we might use them. Maybe we should respond to her call, and do a bit of further research into what is thought and known about consciousness. Dive into the ideas of Terence McKenna, Rupert Sheldrake, and Ralph Abraham. These visionaries engaged in a series of fascinating 3-way conversations over many years, talking about cosmology, teleology, consciousness, evolution, and related esoteric topics. All three are well-versed in the latest research in these areas, some of which is based on psychedelic experiences. Many of their conversations can be found here on Youtube. Their central idea is that the whole universe, at every level from the quantum to the galactic, is both conscious and evolving. One of the ideas they explore is that as complexity increases, new kinds of order emerge, and sudden and unpredictable changes of state can occur. Evolution is episodic (unpredictable radical changes) rather than continuous. In the domain of species evolution, the Cambrian revolution would be an episodic example. In the domain of cultural and social evolution, the agricultural revolution would be an episodic example. If it is social transformation that we are seeking, then I suggest that we need to be thinking in terms of episodic evolution in the social and cultural domain, not the personal. The agricultural revolution, for example, did not emerge because people suddenly become smarter, or reached a more evolved state of consciousness. It was other kinds of forces that were involved, environmental changes and so forth. People were quite evolved enough, as they were, to adapt to the new paradigm and make the most of it. Personal evolution is important. Humanity has been making steady progress, with so much anti-racism, anti-genocide, anti-war movements and with environmental awareness, and with so many people paying attention to, and acting on, the consciousness ideas that Amy, Ken Wilbur, and others who write consciousness expanding instructions. 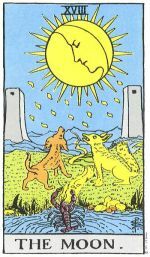 (NOTE: The TAROT CARD the MOON tells us that man is like a wolf who must be driven to walk the golden road by the biting lobster in the waters of the unconscious. It's so painful to be human and vulnerable that we will transform ourselves from brutal rapacious WOLF to gentle, loyal dogs and go beyond the duality of the mind, symbolized by the twin towers of stone, yes/ no thinking, me gain, me lose thinking ... and travel to the highest mountains of consciousness. At that point, heavenly blessings fall on us. The gold flakes are the SIDDHIS or supernatural powers of Gods on Earth. ) We've been preparing ourselves, perhaps due to some emerging morphic field, for a 'change of state' in the social and cultural domain. The socialist 30's, the anti-war, dissident 60's and now the scary Millennium recession which tends to make all the thieves more rapacious.) MOST of us are doing well enough in preparing ourselves, and without dropping the spiritual studies, we need to shift our focus of attention to the social and cultural domain itself. A progressive, rebellious but affirmative change-of-state in that domain is on our doorstep. A new level of complexity has emerged, with globalization, the Internet, OCCUPY, WIKILEAKS. The old order has progressed to sharp Nazism, Me and My Money thinking which we see when we look at bought politicians, Wall Street, market forces collapsing, as was always inevitable. A change of state is underway, in the social and cultural domain, but it's outcome is not yet determined. It's not a matter of whether we'll have social transformation, it's a matter of what form it will take. There is a force toward the center that is operating, toward greater centralization of power, and tighter control over the masses (e.g., NSA surveillance, militarized police, increasingly harsh suppression of protests) – and there is a force toward grassroots empowerment that is operating, as more and more people wake up and pursue change in one way or another. I suggest that these are the forces, within the many forces that underlie the universe, that we need to perceive and consciously work with, if we seek social transformation. It makes sense to compare the two forces. The grassroots has numbers on its side, and the center has the power of the establishment (military and all the rest) on its side. But from the point of view of consciousness, relative power is not the biggest difference between the forces. The biggest difference is that the center has something resembling a coherent consciousness, while the grassroots doesn't. Certainly there are divisions and conflicts in high circles, and pluralism in the system. But the shared interest in 'staying on top', in this time of chaotic change and widespread unrest, brings those on top into increasing unity of purpose, as we see from the various preparations to keep the masses under control. The force toward the center, in this time of episodic transformation, is leading to an increase in coherent consciousness at the top. Meanwhile, in the grassroots, we are responding to impending change not with any kind of coherent consciousness, but more like a disturbed hill of ants, scurrying in every activist direction – while most of the ants (the non-active majority) cling for security to business as usual. Answer Amy's call to action, and then summarize these observations: we can – and indeed, must – develop our own powers to perceive the forces that underlie the universe and then use those powers to consciously create a much better world. From the perspective of evolution, at the level of culture and society, we are at the chaotic stage of an episodic change of state. At such times new and unpredicted forms of system organization have an opportunity to emerge. One seeking-to-emerge outcome is a more centralized form of organization, enabling the management of resources and populations, and replacing the dynamics of growth and market forces. Another seeking-to-emerge outcome is some kind of decentralized form of organization, empowered by energy at the grassroots. The energy at the grassroots, however, lacks any kind of coherent consciousness. There are however forces pushing toward the emergence of grassroots coherence. The accessibility of global communications, including even the mass media, has been leading toward convergences in perspectives on a global scale. The Internet in particular has led to a renaissance in grassroots creativity, and the wide sharing of innovative ideas in all areas of thought and endeavor. Movement leaders, meanwhile, are searching for new ways to be effective. It's like the sparks are flying in an embryonic grassroots mind, but haven't yet gelled into any kind of coherent consciousness. If we want to help create a better world, and if we want to work with the evolutionary forces that underlie the universe, then it seems to me we need to be encouraging the emergence of coherence (100th monkey theory,) in grassroots energy, and ultimately the emergence of a coherent we-the-people consciousness anchored in a decentralized form of organization. A rare opportunity exists for such a radical social and cultural transformation to occur, in this chaotic stage of episodic social evolution, as the old organizing principle is collapsing. There is already a considerable energy focus among progressive activists and visionaries in the direction of decentralized organization. This focus is expressed in the Transition Town movement, along with initiatives promoting local currencies, buy-local campaigns, community gardens, ecovillages, and farmer's markets. These initiatives reflect a growing recognition that the old growth-based economic order cannot last, and they are seeking to create a sustainable economic order, by means of locally-based initiatives. These initiatives have social transformation in mind – they are not simply local self-help movements. They have a vision of creating a new economic order based on the decentralized management of resources and economics. They represent the emergence of a decentralized ordering principle, competing with the emergence of a greater-centralization ordering principle, in this time of chaotic transition. At the community level, these initiatives are pursued autonomously by local activists, and their aim is to get the community as a whole to engage in their initiatives. Their strategy for bringing about change is ultimately based on this organizational paradigm: If we all work together, here in our community, we can create a better future for ourselves. From this perspective, we can see that these movements toward decentralization carry within them the seeds of coherent grassroots consciousness. If the community as a whole were to engage with the initiatives, and start working together to shape its own future, then that community would indeed be developing a coherent local consciousness, and it would be increasingly acting as a coherent, learning organism, based on that consciousness. These initiatives, though widespread geographically, have not so far been able to get whole communities to work together to shape their own future. In the overall scheme of things the initiatives have remained marginal, and show no signs of growing beyond that. Nonetheless they are out there, with considerable energy behind them, awaiting the emergence of conditions that will enable them to ignite local engagement. Let's explore briefly this notion of a community as a coherent, learning organism, with a growing coherent consciousness. It leads to a vision of society as an ecosystem of interacting autonomous communities, each operating on the let's-all-work-together paradigm. It seems self evident to me that the relationship between such communities would naturally also be based on the same paradigm – it would become a core cultural principle - the way things get done – throughout such a society. Lest misunderstanding slip in here, let me underscore that this emergent let's-all-work-together paradigm is about voluntary collaboration for mutual benefit. It is not about any kind of communist vision, or any kind of surrender of the individual to the collective. It is about the empowerment of the individual through participating voluntarily in locally-generated cooperative endeavors aimed at making a better future for everyone. Doing business with one another, under agreed rules of conduct, using an agreed currency, is one example of a voluntary cooperative endeavor. The seeds of such a society, I suggest, are being carried within the decentralization initiatives, regardless of whether or not the activists involved consciously hold such visions. We are seeing the emergence of a morphic field, generated by the energy of sustainability-consciouness, but whose circle of resonance turns out to be much wider, extending to a culture of voluntary collaboration, and a society organized on the basis of locally coherent grassroots consciousness. If this voluntary-collaboration morphic field were to get energized past a certain tipping point, of scale and coherence, via community initiatives of various kinds, it could become a real contender for evolutionary dominance, even in the face of the seemingly all-powerful morphic field emerging around greater centralization. It has legs. So far however, this grassroots-based morphic field remains in an embryonic holding pattern, the flame being fortunately maintained by a persistent band of decentralization activists. In order to consider the question of how this morphic field might be energized, we need to step back and consider a much wider social context. In particular, we need to think about the 'field of public consciousness', and the question of subfields of morphic resonance, and how they interact with one another. It is in this field of public consciousness that our embryonic morphic field will need to struggle for emergence and growth. There are many subfields of morphic resonance in our societies, of one degree of coherence or another. We've been considering so far a relatively marginal subfield, of like-minded activists, whose value lies latent. We now need to turn our attention to the more dominant subfields of morphic resonance in our societies, those energized by strong attractors, such as religions, political parties, popular causes, class identities, and shared economic circumstances. It takes but little reflection on this 'field of public consciousness' to see that the various resonant subfields are in a chaotic relationship with one another. If we try to think of 'the field of public consciousness' as a 'popular mind', we would have to diagnose it as being a severely schizophrenic mind. A mind with strong urges pulling in different directions, and with no ability to manifest coherence out of that chaos – apart from handing that responsibility over to governments, who are increasingly entranced by the morphic subfield whose center of resonance is the centralization of power. When decentralization activists try to promote their initiatives in their communities, it is like someone trying to explain to a person who is suffering from severe schizophrenia how their life can be fixed. Such a person doesn't respond to logical reasoning from laymen, they need appropriate therapy first. They need coherence of mind before they can benefit from logical thinking. The morphic field around decentralization holds the seeds of coherent community consciousness, but those seeds cannot be planted until some degree of coherent community consciousness emerges by some other means. Therapeutic intervention is called for, aimed at generating some degree of harmonization where now there is only chaotic dissonance, among the dominant subfields of morphic resonance in our communities. To put that in plainer language, communication and mutual understanding needs to be nurtured among the various segments of our communities. They need to understand one another's concerns, and to learn to respect one another as fellow members of the same community. These kinds of things need to happen to a sufficient degree, and on a sufficient scale within a community, to enable enough overall coherence to emerge, so that it will make sense to begin talking about sensible directions for community energy. You can't talk about community energy as a reified thing, until there is some semblance of coherent community consciousness. If we envision an activist initiative, aimed at fostering mutual understanding among segments of a community, it would have certain advantages in its favor, as compared to most activist initiatives, which are aimed at engaging citizens in some kind of action. Our envisioned initiative would simply be about people talking with one another, with no need to solve any problem, or reach any agreement, but simply to understand where one another are coming from. One could imagine such an initiative taking many forms, from organizing neighborhood potluck conversations, to organizing a series of community presentations in a public hall, where different groups take turns telling their stories. There is perhaps inspiration we can take, in this regard, from an episodic shift that happened in human consciousness about 50,000 years ago. This was one of the topics the three visionaries talked about in their video conversations. 50,000 years ago is when cave paintings first appeared, and evidence of early religions first emerged. Ralph Abraham said that skull-evidence reveals that a change in brain structure occurred about then, a stronger connection between the left and right hemispheres. The left brain operates linearly and logically, while the right brain operates in terms of patterns and images. A stronger connection between them means the two hemispheres can work together in new and different ways. As regards cave paintings, one can imagine that the artist's left brain has a goal, of painting an animal in action, and by means of the stronger connection can call on the right brain to recall an image of the animal in action, so it can be referred to while paining. That is to say, the stronger connection enables enhanced functioning of the human imagination. The different segments of our community are like poorly connected brain lobes. And like the left and right brains they each have a contribution to make to the whole – but they don't talk to one another. Just as the strengthening of brain connections led to enhanced individual imagination, so can enhanced communication among segments lead to enhanced community imagination, as well as more coherent community consciousness generally. The decentralization morphic field would be able to merge its imaginative energy into the emerging consciousness field of the community, making its contribution along with others we may not anticipate. Let me close by citing once again Amy's call to action:. we can – and indeed, must – develop our own powers to perceive the forces that underlie the universe and then use those powers to consciously create a much better world. You want to be forwarding the action, at least so you can answer the grandkids when they ask, ‘what were you doing during that time, grandpa? Granny?